Imagine you’re playing a turn-based RPG, character geared and ready to take on whatever bursts out of the next dungeon room. You confidently take one step in with your trusty weapon at your side when suddenly five enemies surround you. Each enemy needs to be surgically dispatched by precisely analyzing flanking positions, attack ranges, and defensive maneuvers. The catch is, you have less than a second to decide each turn. Crypt of the Necrodancer by Brace Yourself Games is this kind of adrenaline-laced experience, with each beat of its soundtrack forcing you and your enemies into action. There is no time to ponder all of your options as you’re literally dancing around the battlefield. It’s a challenging and addicting game that refreshes a traditionally slow-paced genre with an arcade-style vibe. Crypt of the Necrodancer pulls you in immediately with its catchy techno beats, getting you into a pumped up mood for the unforgiving challenges to come. It eases you into things with a brief tutorial that outlines the basics: move to the beat, and attack enemies safely by discerning their movement patterns. The pixel art style is crisp and full of personality, with sprites colorized in a vibrant palette and bouncy animations that befit the dance-like atmosphere. 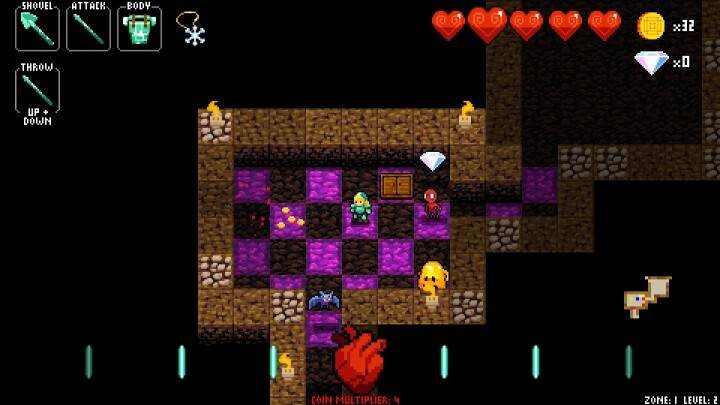 However, you’ll find that very soon into your first dungeon zone there’s no time to simply groove along with the music. Each mistake made feels like your own fault for not being yet skilled enough. Since each beat of the song forces a decision, whether it be to move, attack, or use an item, it’s easy to get caught unexpectedly by a monster who just happened to stomp into your space. Each enemy has its own distinct pattern to learn and battles quickly becomes an intense puzzle game as you face a roomful of several different kinds of them at once. It can be a stressful experience as, being true to the rules of a roguelike, you’ll lose all of your upgraded equipment and items upon death and start over from the very first floor. It never gets overly frustrating though, as enemy patterns are designed fairly with very little random surprises. Each mistake made feels like your own fault for not being yet skilled enough. To help you conquer the increasingly difficult dungeon floors, you can seek out diamonds to bring back to the game lobby after a death. You use these pickups like currency, purchasing stronger weapons and hardier armor unlocks for you to find in chests on your next run. You’ll lose all of your collected diamonds each time you restart though, so to unlock the more expensive gear you’ll have to survive longer. This really hooks you into that “just one more” feeling as you attempt to push deeper and deeper into the dungeon zones. It’s likely that you’ve cleared all the available zones by now, successfully besting foes like rampaging minotaurs and fire-breathing dragons. You’ve also seen most if not all of the game’s bosses, who have the most challenging patterns and their own unique songs to learn. The Conga King can pause the beat while leading a snaking zombie conga line towards you. The Coral Riff is a giant hopping guitar that slows you down with a water-filled battleground. After engaging and perhaps failing against them time after time, you’ll be ready to tackle the All Zones Mode. All Zones Mode is a speedrun mode where you attempt to complete all unlocked zones as fast as possible. If you die, you don’t get to start over at the beginning of a zone like before. You start with a blank slate all the way back at Zone 1. It can be an exhilarating game mode as you begin runs with less health, but have all items unlocked. It’s possible to collect an arsenal capable of one-shotting even mini-bosses, but one critical misstep means the run is over and you’re back to square one. If you can make it all the way to the final boss in the last zone, your heart will be pounding to the beat, or even faster. 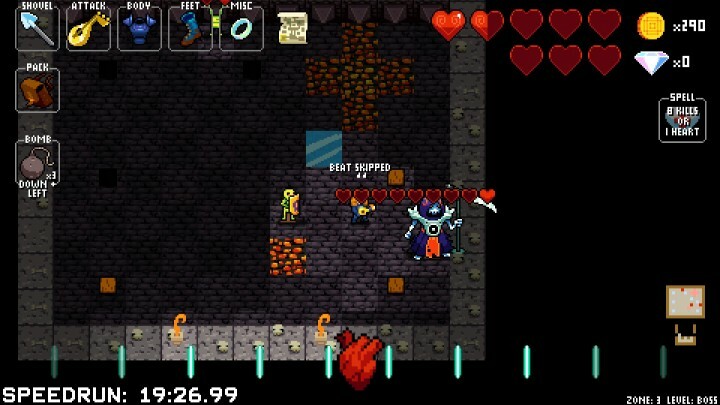 Completing All Zones Mode, besides bragging rights, will also give you access to most of the alternate characters of Crypt of the Necrodancer. Every character is notably different in gameplay style, significantly changing up your approach to the game. There’s a character who only has access to dropping and kicking bombs, one who moves at double tempo, and one who is killed by picking up gold to name just a few. Running through zones and facing enemies that you’ve previously mastered as someone new can make the game feel fresh all over again. You’ll probably have completed most all of the available content after a few dozen more runs. With expertise comes predictability in both dealing with enemies and dungeon layout. Facing off against four or five monsters doesn’t feel as intimidating, and the process of traversing around traps is practically muscle memory. Playing the game repeatedly loses the appeal of progression since all diamond items have been purchased and characters have all been unlocked. Speedruns are still a challenging way to play, but because there is no longer a content incentive to achieve it becomes akin to an arcade score attack. It’s still fun to pick up and play occasionally, but not as addicting as it used to be when mastering new enemy patterns, purchasing hard-earned upgrades, and hearing great new music tracks with each unlocked dungeon floor. 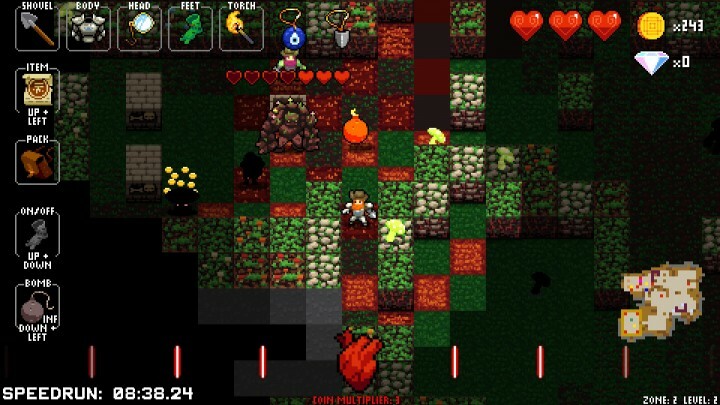 Crypt of the Necrodancer is an excellent example of creative gameplay design breathing new life into a classic gaming formula. It’s frustrating in a good way, making you learn and improve with each new run through its randomly generated death traps. The experience does eventually wear itself out, but that’s really only when you’ve nearly mastered everything the game can throw at you. Until then, it’s a completely satisfying dose of fun that’s well worth diving (and dancing) into.